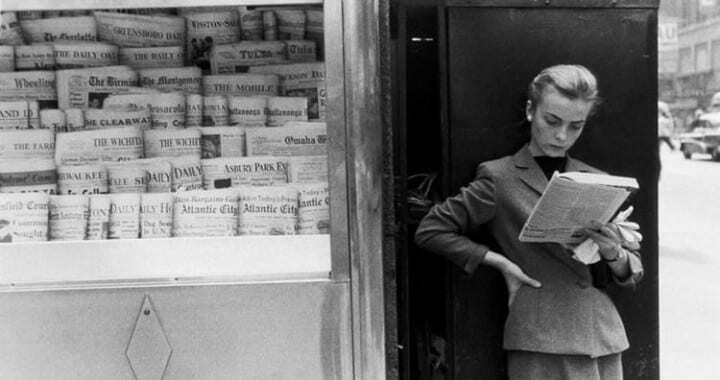 [column width=”45%” padding_right=”20px”]The first image you see in this small show, Out of Town, Newsstand, is of a neatly tailored woman, perhaps a model, looking down into the last pages of what may have been the latest edition of Vogue. 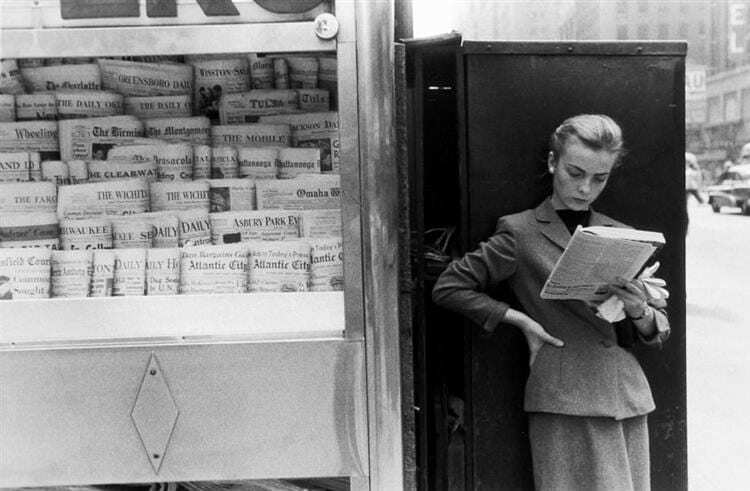 Framing her is the dark rectangle of the newsstand’s enclosure, and, to our left, are tiers of out of town newspapers. 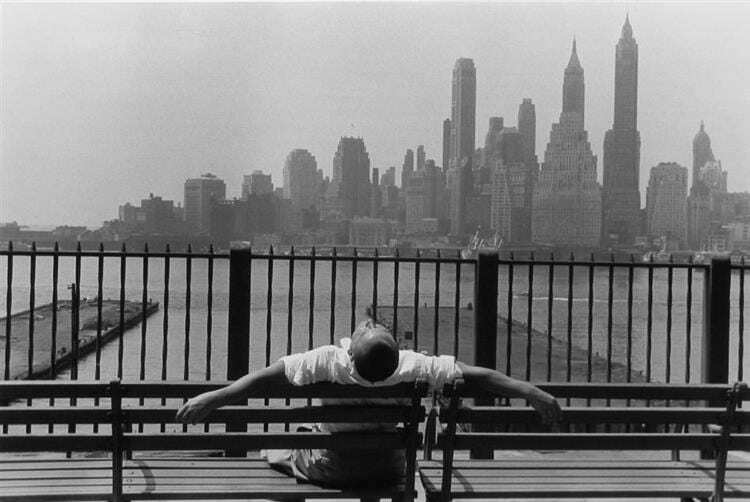 This image, one of Stettner’s most famous, was chosen by him to lead off this retrospective show. It’s an odd choice given his life long interest in humanistic photography, yet it tells us much about the dichotomy he finds between Paris and New York. The woman is confident and self-assured in her fashionable clothing, not empathetic or vulnerable at all – she’s a Hitchcock heroine early in the movie, before the characters develop, before the tourists arrive. All the elements of Stettner’s New York work are here, I think: the wish to humanize, fascination with the city’s hard shell, the infinite ways in which the city frames itself and its inhabitants for the lens. [column width=”45%” padding_right=”20px”]It does remain, however, to look for what distinguishes his work from that of this amazing group, and what distinguishes his New York views from those taken in Paris. The two cities are quite different. Paris is a nebulous affair with many downtowns and residential areas. When the humanist lens was creating our view of Paris, the city was being rebuilt from the devastation of the war. Laborers owned the streets and there was a common, social purpose between the photographers documenting the rise from ashes and the people of the city. This was the atmosphere in which Stettner honed his craft, but, infectious as it is, this atmosphere never exists in New York. The New York themes are the burden of social complexity and isolation of the city, rather than its humanity. In The Great White Way, a ghoulish silhouette arises from purgatory via a manhole and lumbers towards the theater marquee of Kazan’s On the Waterfront. This specter, reminiscent of Terry/Brando’s murdered brother, has a dispensation to see the evening showing of his demise. You never knew who you were sitting next to in those 42nd Street theaters. This thrill and fear follows other New York endeavors. Heads bob in the bull’s eye painted around observation holes in the fence at Construction Site, Manhattan and an anonymous, tee shirted young man, lounges on the Promenade, Brooklyn, New York. The city, in menace or repose, appears hazily over the water, behind a spiked, barrier fence. Is it watching our isolated laborer in a zoo it has made for its workers, or is he enjoying a respite from its soul-consuming demands? Excerpt’s from Stettner’s Subway Series, including images from Penn Station, are displayed next. These include the few images in which adults share eye contact with the viewer. [column width=”45%” padding_right=”20px”]Each holds their own hands; something has transpired between them, and the woman exasperatedly looks away, whereas her companion, almost pleadingly, engages our vision. He confirms the universal experience of these difficult, public moments; we sympathize. There is, perhaps, no city on earth with as much public camaraderie as Paris. Whether or not this is a fiction or reality created by the photographers mentioned earlier, Stettner is clearly more at home in his adopted city, and he photographs as though this imagistic humanism is de rigueur, the only way to see. He himself has stated that he photographed for this coterie and not for a gallery. Here, children play (Deux Filles, Rue Des Matyrs), lovers relax (Jardin Du Luxembourg) and cuddle (Jardin Des Tuileries), and a lone newspaper vendor enjoys the cafe scene, even if only by proximity (Ras, pres du Cafe le Dome). Posted in Exhibitions, Reviews and tagged Black and White Photogrpahy, Bonni Benrubi Gallery, Exhibition Review, Louis Stettner, New York City.